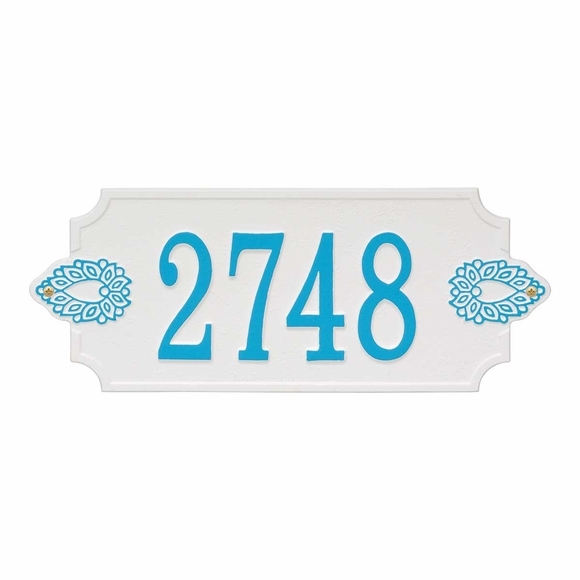 Decorative House Number Sign - - one line wall sign personalized with the house number you supply and the color your select. Eighteen color combinations, including fresh and unexpected stucco with magenta characters, dazzling blue with white characters, and scuba blue with white characters. Made in USA. Prominent design features on this unique address sign are the rectangular shape with concave corners, stunning elongated medallions that extend beyond the plaque surface, and the unusual self border (border color and plaque color are the same). House number line holds up to five (5) 4" characters. White with aruba blue characters is shown in the large image. Top row small image colors from left to right: BV bronze verdigris; C8 dazzling blue with white characters; C9 scuba blue with white characters; DW dark blue with white characters; L7 stucco with magenta characters; and WH white with black characters. The remaining colors are shown in the color chart in the row by itself. House number shown in images: 2748.